Young Love and GOODNESS FALLS | VEHICLE: 1) Ty Roth's blog; 2) a medium for thought, feeling, or action. During the three-minute passing time between classes, it’s far from unusual to see young couples stealing intimate moments in the hallways, stairways, and recessed eddies of any high school building. Typically, they leave less than a hair’s breadth between them, hold hands, embrace, kiss, and gaze into one another’s eyes as if staring at the unlocked secrets of the cosmos and as if they may never look into each other’s eyes ever again. Neither the risk of being called out for “PDA” by teachers or being urged to “get a room” by passing students seems to dissuade their attempts to immerse themselves in one another as completely as possible in that shared space and for that brief span. I know that many find such displays of public affection to be distasteful and inappropriate, and I would agree that occasionally these amorous couples stretch the bounds of propriety. However, in the main, I am not bothered by them, and I can’t help but wonder if those who are put off aren’t just a little bit jealous: jealous to be young again, jealous to be swept away in the throes of a first love, jealous to yearn so much for someone that you couldn’t care less what anyone else thinks; jealous to be so intimately connected to another person that time and place are meaningless; and jealous to completely jones for another in heart, body, and soul. I mean, really, who are they hurting? Shakespeare once wrote “Let me not to the marriage of true minds [his definition of Love] admit impediments.” Lenny Kravitz seconded that emotion when he sang “Let love rule.” To both, I say amen. In my soon-to-be-released novel, GOODNESS FALLS, the main character, T.J. Farrell, is in just such an all-consuming relationship, as described above, with his girlfriend, Caly Stone. Like many young lovers, they can’t imagine a present or future without the other. They often imagine and talk of marriage and the blissful life that awaits them beyond the suffocating borders of their hometown of Goodness Falls. The more-jaded among us might find their imaginings and talk, at best, cute and, at worst, silly for a pair of eighteen-year old young adults. But be warned that many tragedies, real and fictional, have been precipitated by adults who failed to remember or to take seriously the depth of such young and intense love. In typical narrative fashion of star-crossed lovers from opposite sides of town, T.J. and Caly are challenged to overcome those doubters and events beyond their control that seem to conspire to place “impediments” in the way of their simple desire to love and be loved. 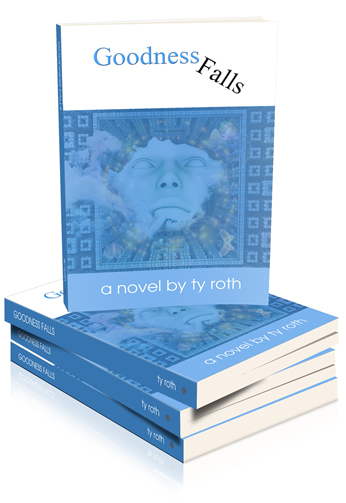 Posted on March 12, 2014 by Ty Roth	• This entry was posted in Uncategorized and tagged Goodness Falls, ty roth, YA Romance, young adult novels, young love. Bookmark the permalink.